Located about an hour northeast of Las Vegas, Nevada’s Valley of Fire State Park is noted for its outlandish rock formations. 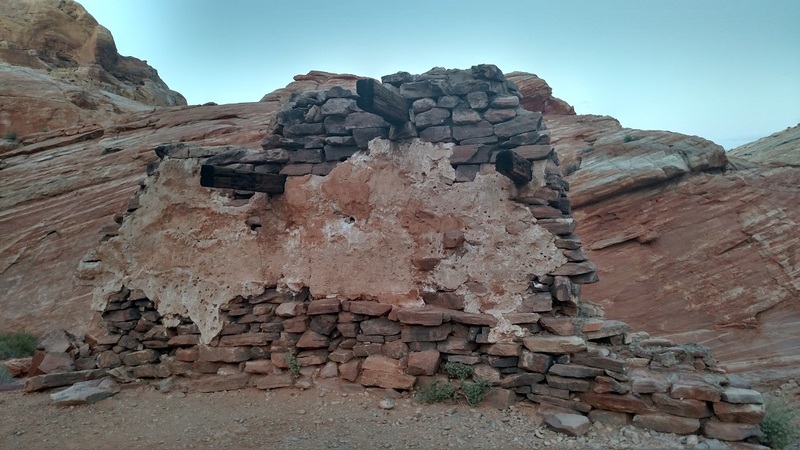 The famous and recognizable “Fire Wave” is one of two hikes profiled in this post; the other is the short but adventurous White Domes Trail, visiting a remote canyon that has been a favorite location of film and television. 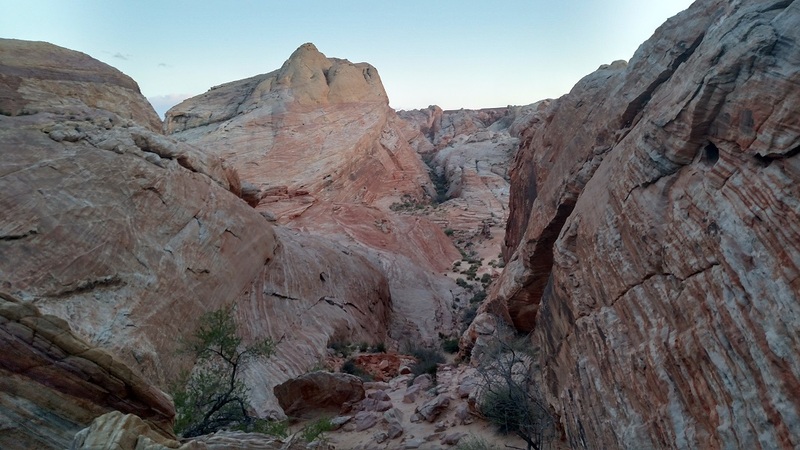 Valley of Fire is becoming an increasingly popular destination for L.A. area hikers and given the park’s phenomenal scenery, it’s easy to see why. 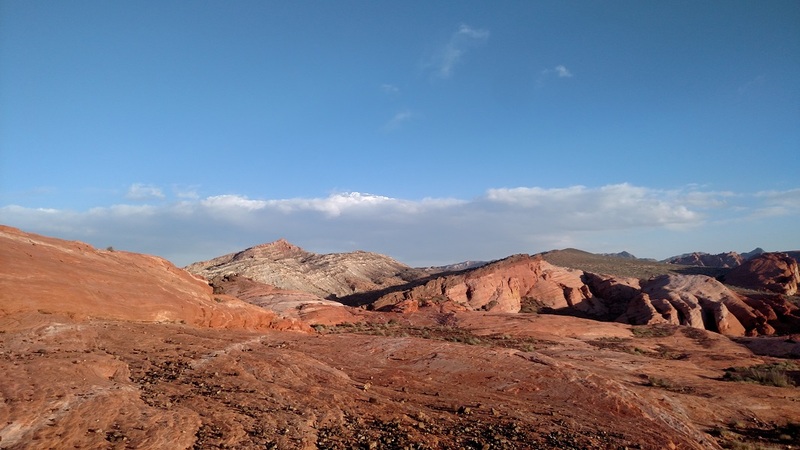 Getting to Valley of Fire State Park: The park is a little over 300 miles from downtown Los Angeles. Depending on traffic and which area of Los Angeles you are coming from, expect a 5-7 hour drive each way. 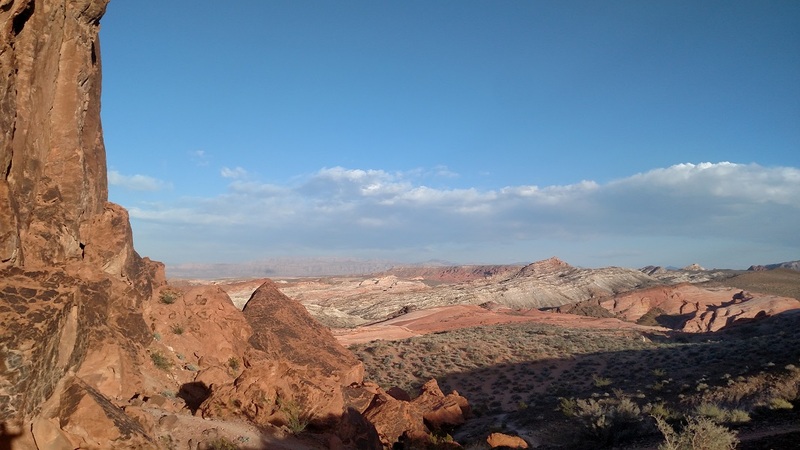 The park is about an hour’s drive from McCarran International Airport. 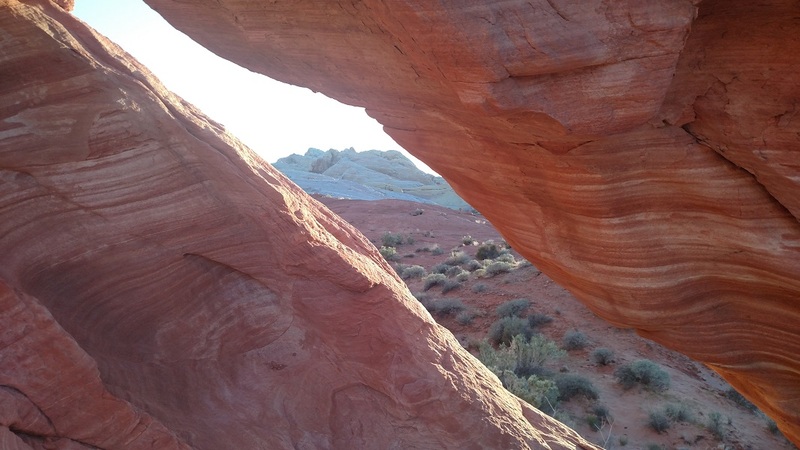 Several outfitters offer guided tours of Valley of Fire State Park, including hotel pickup and drop off. 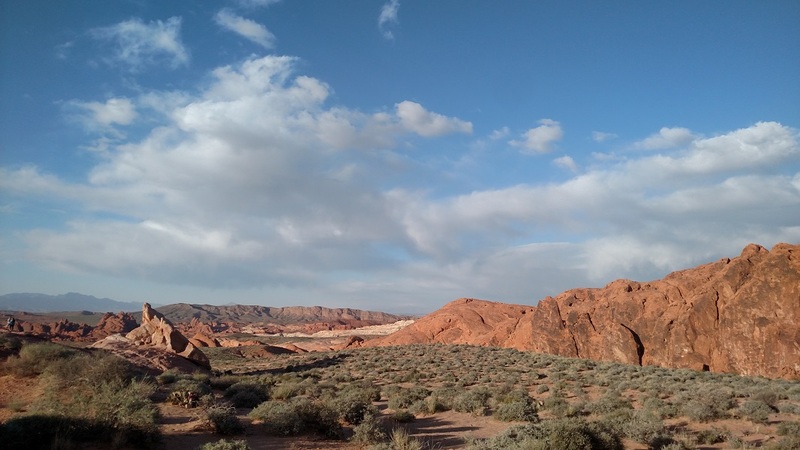 Staying at Valley of Fire State Park: The park has 72 campsites available on a first-come, first-serve basis for $20 per night (your park entrance fee is included). During peak season, the sites tend to fill up quickly. If you are driving from the L.A. area the campgrounds may well be full by the time you arrive, especially on weekends. For hotel or motel accommodations, the nearest town is Overton, about a half hour drive. 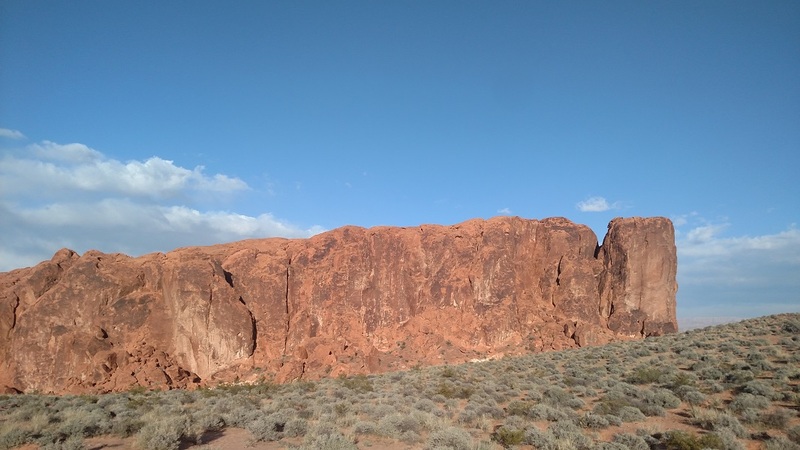 Las Vegas is a good alternative as there are more lodging choices (if you are coming from Los Angeles, staying in Vegas will break up the drive; Overton is farther north and would ultimately require more driving). The nearest services of any kind are at a travel plaza off exit 75 of Interstate 15, about a 45 minute drive from the Fire Wave and White Domes trails. 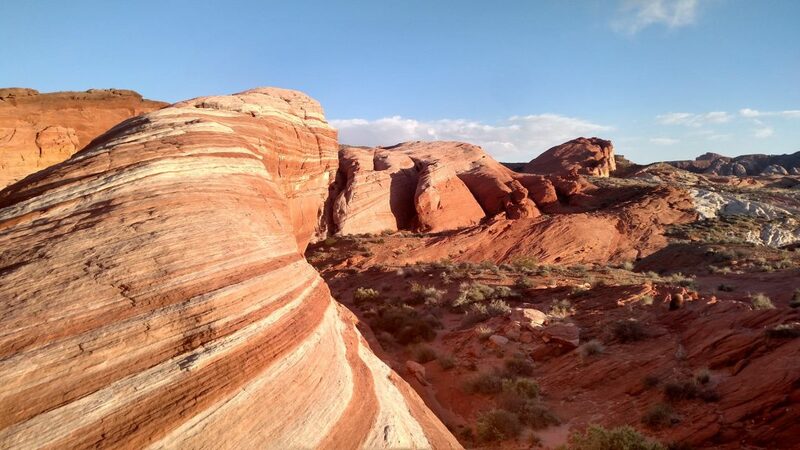 Weather: Like Joshua Tree National Park, Valley of Fire State Park experiences a wide range of temperatures, from average lows of 38 degrees in January to average highs of 105 degrees in July. The park receives an average of 6.5 inches of precipitation per year (including an average 0.4 inches of snow). Cell phone reception: Weak by the park entrance; none in the park (park literature claims that there is cell phone reception at the trail heads but I didn’t have any). Dogs: Allowed on leash but exercise caution on warm days (for tips on hiking safely with dogs, click here). 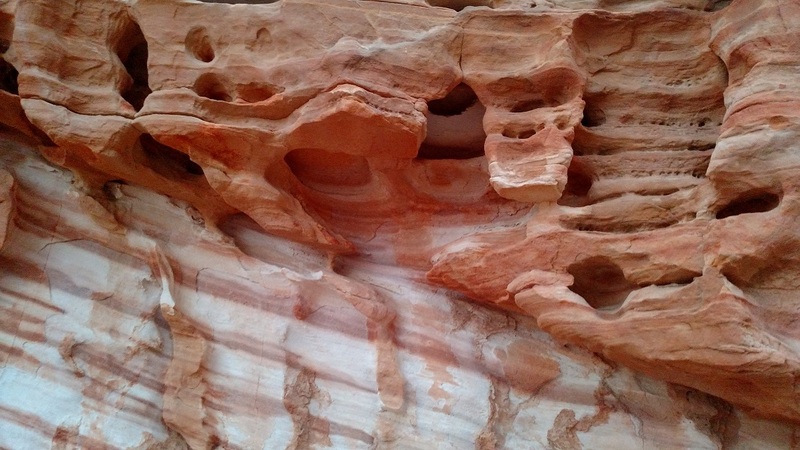 Much of Valley of Fire State Park’s geology is sandstone dating back about 150 million years. 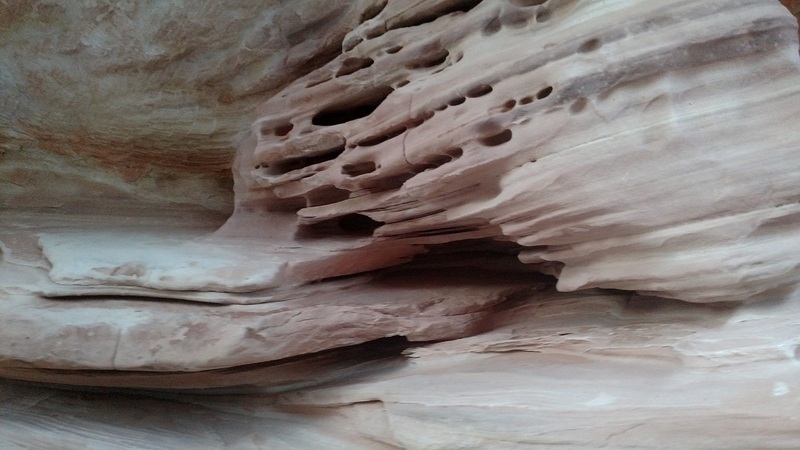 Like many of the other geological features of the park, the Fire Wave was once a sand dune. Today, its curved shape and orange, pink and white stripes make it the most recognizable formation in the park. The official trail was built relatively recently; it is sometimes difficult to distinguish from the various footpaths that hikers have left over the years but navigation is still fairly straightforward. You head east and then south, enjoying panoramic views of the park before following the base of a long sandstone formation. A few signs help delineate the official route. The Fire Wave is less than three quarters of a mile from the trail head. 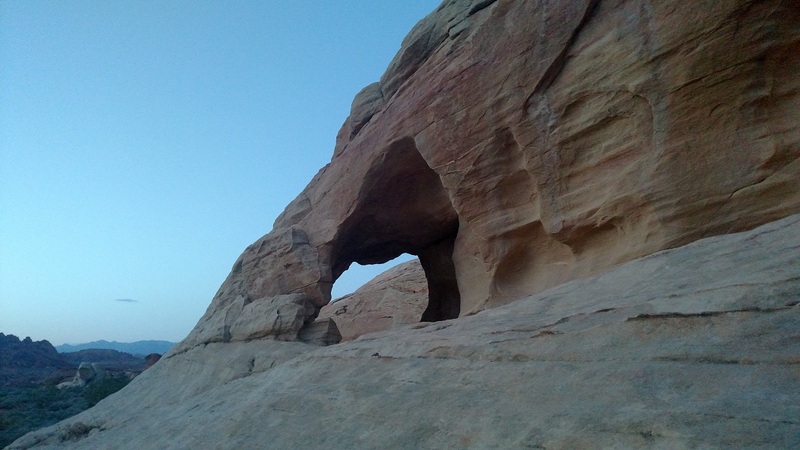 Also worth exploring is the sandstone wall on the opposite side of the wash, featuring several narrow caves and a small arch. Just a short distance up the road from the Fire Wave, White Domes offers an equally exciting and totally different hiking experience. 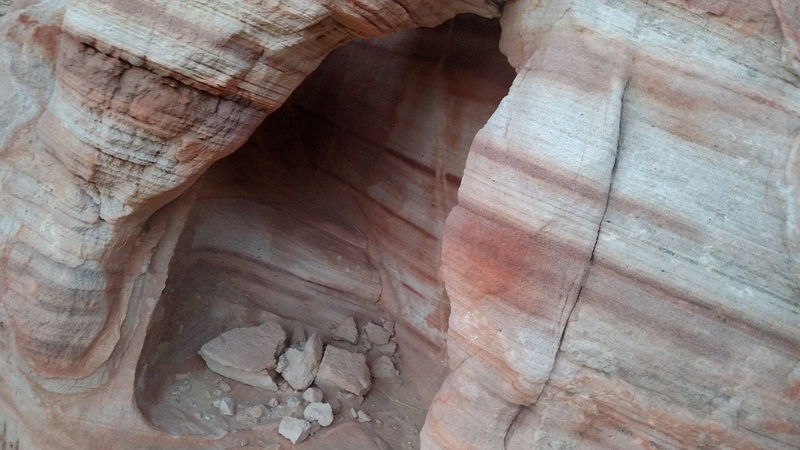 The trail leaves from the end of the road by the restrooms and follows a sandy wash beneath a large sandstone formation. It then makes a short but steep and rugged drop (expect to use your hands as well as your feet) into a canyon where the remains of a movie set from the 1965 film “The Professionals” still stands. The trail then bends west (right) and enters a narrow but easily navigable slot. 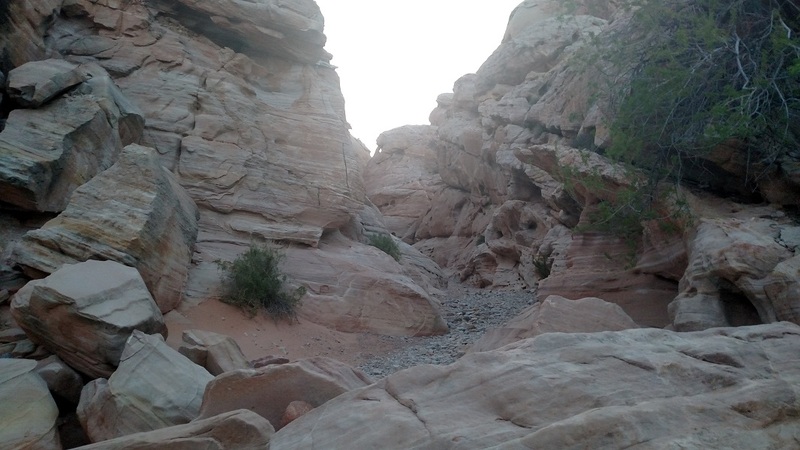 On the opposite side of the slot, the trail climbs along a small ledge with a canyon on the left and the large sandstone formations you passed by earlier on the right. 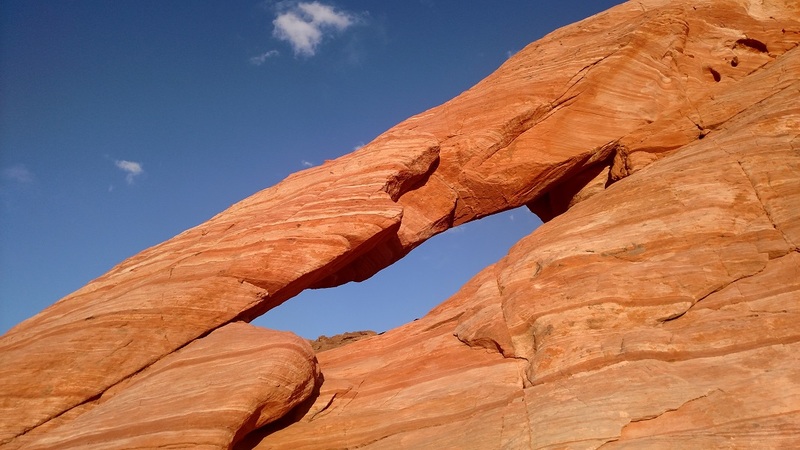 Keep an eye out for a small arch in one of the rocks. 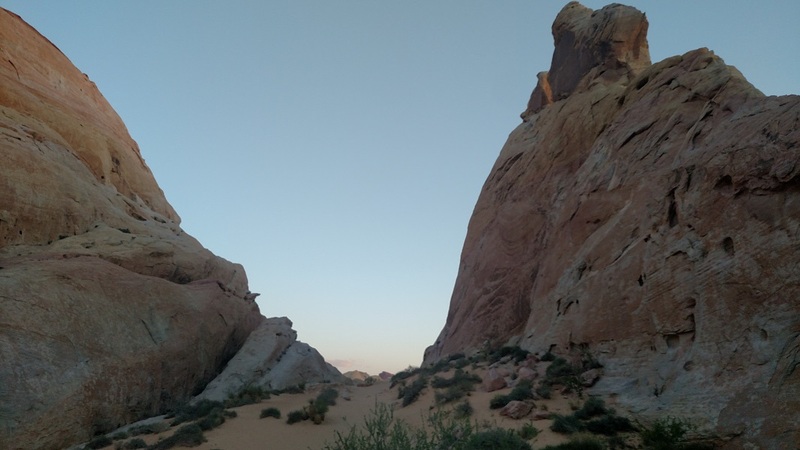 The trail then threads the gap between two of the larger formations and then heads south for its final stretch, paralleling the road and soon returning to the parking lot. Love that place so much!